October is Hillsboro Arts Month, and this year participants have the chance to win prizes from local business with the Arts Month Experience Card. Kicking off at ArtFest on the Plaza on September 22 and running through the end of October, Hillsboro Arts Month is an initiative of the Hillsboro Arts & Culture Council designed to highlight the arts and culture community of the city. Arts Month offers over 60 events across a range of arts and culture disciplines, including literary arts, visual arts, music, theater, dance, spoken word, film, and history. Participants can pick up an Arts Month Experience Card at ArtFest on the Plaza on September 22 or at the Walters Cultural Arts Center (527 E. Main St., Hillsboro) throughout the month, and can receive a sticker at participating events during Art Month. Upon collecting stickers from four events and returning the card to the Walters by November 1, participants will receive a coupon for a free cup of tea, cider, or hot chocolate from Perks of Art (384 E. Main St., Hillsboro) and be entered to win prize packages generously donated by local businesses and organizations including Perks of Art, Bag&Baggage Productions, Primrose & Tumbleweeds, Hillsboro Symphony Orchestra, McNally’s Taproom, Tonya Macalino Books, Hillsboro Community Senior Center, Piccolo Mondo Toys, and Washington County Museum. Winners will be drawn at First Tuesday Art Walk at the Walters on November 6. 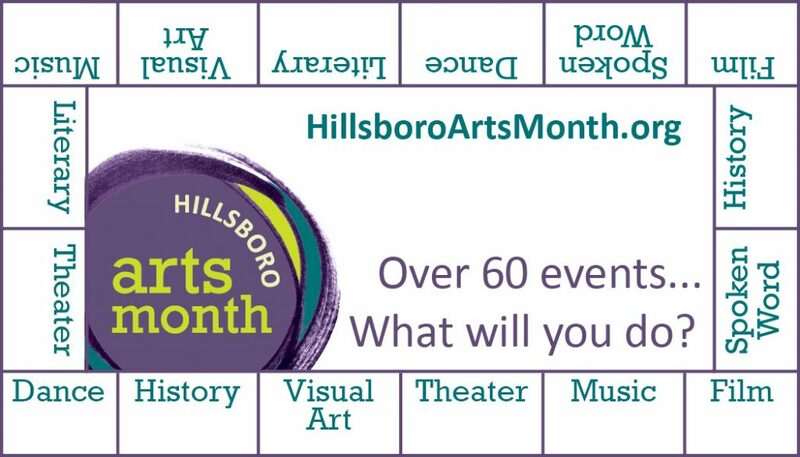 All events listed at HillsboroArtsMonth.org are considered participating events, and include: STAGES production of Agatha Christie’s And Then There Were None (HART Theater, October 5-14); The Time Travelers’ Ball hosted by the Hillsboro Historical Society (Odd Fellows Lodge, October 13); Washington County Open Studios Tour (October 20-21); and many more.